The Beautiful Game Returns !!! Okay.. I’m not going to do any thread-bare analysis of strengths of different teams and all..but still a bit of analysis ..
Caveat :- Only if they manage to get Pavel Nedved back into the team. Reason – Nedved , one of the most gifted and accomplished players of his generation in club soccer deserves something better in international soccer..I still remember that amazing match in last world cup where an inspired Italian defence marshalled by Cannavaro kicked Czechs out of the world cup.. And last Euro, wherein his injury limped him off the field in that semi final against Greece..The current Czech captain , Tomas Rosicky ( another of my favorite players ) is nursing an injury and because of that , calls for Nedved to come back to the team has intensified .. Retired from international soccer , but playing in Italian league in a good way, I hope he does a ‘la Zidane act and carries Czechs all the way to glory :-). An unlikely pick, but my vote goes for Romania in this category. 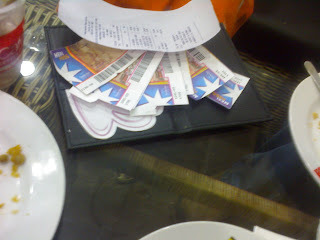 They say two weeks :( ... And chances of further slippings.. Things getting tight by every passing day... Hmmmm.... I wish I could give some satire links..but, then it would become a different ball game . These two snaps describe what happens when a group of IT pros , empowered with Sodexho coupons visit CCD :-) .. One glass of "iced eskimo ...." ( none knew what it was :-) ) shared using 4 straws. 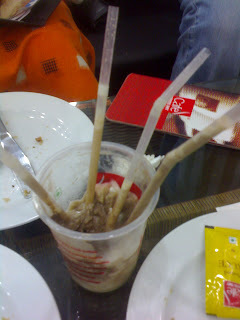 CCD people would have been accustomed to couples using two straws in one glass..But this would have been something new to them :-) ..